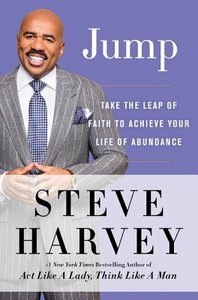 #1 New York Times bestselling author Steve Harvey helps you engage the Divine Spirit within you to find your life's desire and use your own imagination to make your life's vision a reality. At the beginning of each broadcast of his morning radio show, Steve Harvey offers his millions of listeners a few moments of spiritual advice to inspire and guide them. Fans love Steve's wisdom and often share his insightful messages with friends and family. In this essential book, Steve expands on those daily words of wisdom by providing fans-and anyone in need of spiritual support, comfort, or guidance-this heartfelt collection of spiritual devotions. Steve beautifully and thoughtfully explains what faith is and how it can work miracles in our daily lives. He also talks in-depth about the power of human imagination and how we can use it to make our dreams come true. Steve believes that no vision enters our minds without our ability to make it a reality. As God inspires us to build and create a larger vision for our lives, Steve shows us that when we combine our inherent power with God's divine plan, we can each achieve anything. Steve also reveals the power of using imagination, faith, and hard work to make our visions a reality. Written in an engaging storytelling format in Steve's warm, inviting voice, each chapter of this thoughtful book offers invaluable advice and anecdotes that illuminate the power of imagination and how to use our God-given visions to enrich our lives. About "Unti Steve Harvey (Book 4)"
Steve Harvey was born in 1957 in West Virginia, U.S. He is actor, comedian, radio and television personality, and best-selling author. Harvey is the author of Act Like a Lady, Think Like a Man: What Men Really Think About Love, Relationships, Intimacy, and Commitment (Amistad Press 2009) and Straight Talk, No Chaser: How to Find, Keep, and Understand a Man (Amistad Press 2010). Harvey lives in Atlanta, Georgia.